MARCUS ROBERTSHAW netted an injury-time equaliser for Steyning Town Football Club to deny his old club Storrington victory in the Old Farm Derby on Saturday. The former Swans man returned to haunt his old club in the County League Division 2 game. 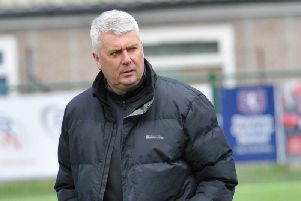 Storrington should have been out of sight by the break and Steyning manager John Suter believed his side were lucky to still be in the game to grab a share of the spoils. He said: “We were fortunate not to concede more goals, a combination of goalkeeping by Aaron Jeal and wasteful finishing by Storrington kept the score down to 1-0 at half-time. “The dynamics of the game when Storrington were 2-1 up changed as teams tend at times to try to protect it, although they still had chances to score. Storrington enjoyed a lively first half but came up against an in-form Jeal, who continued to deny them until they made a breakthrough in the 32nd minute when Will Garrett put the hosts 1-0 up. After the break, it was much of the same from Swans who made it 2-0 when Richard Ayres got his name on the scoresheet in the 65th minute. Steyning got a goal back just four minutes later when Mo Shuga’a found the back of the net to give Steyning a glimmer of hope. An inspired three-player substitution in five minutes from Suter gave his side the momentum they needed as they pressed for an equaliser. It came in the first minute of injury-time when Robertshaw struck to salvage a point. The draw leaves Steyning in ninth place in County League Division 2, just a point behind Haywards Heath, with three games in hand. Steyning travel to leaders Worthing United on Saturday, before they are away to Ryman League South Division side Worthing in the Sussex Senior Cup on Wednesday. The winners will entertain Burgess Hill in the quarter-finals. STEYNING Jeal; Hare, Finch, Parsons, Early; Shuga’a, Dodd, Towse, Clark; Milner, Robertshaw. Subs: Gritt (Early), Warr (Clark), Pickup (Milner).